Is this an Antique Car? I travel out of state often, is there anything special I should know or do ? If you travel outside of Massachusetts to another state or to Canada, it is a good idea to have your insurance policy or proof of insurance with you. Your agent or insurance company can provide these forms. What about plates and inspection stickers ? It is your responsibility to make sure that your safety inspection sticker and your registration plates are current. If you fail to renew on time, you may be fined and surcharged. You must pay your premium to avoid cancellation of your insurance. On the effective date, cancellations are electronically reported to the Registry of Motor Vehicles. My child will be getting their license soon, what do I need to do for them to use my car ? If any of your children who are household members obtain a driver’s license you must notify your company within 60 days of that date. You must list all licensed household members and any other licensed person who will customarily operate your auto. Can I say I live at a different address in order to get a cheaper rate? This is insurance fraud and could cost you a denial of coverage if a loss occurs and it is determined that you live in a higher rated territory. What happens if some of the information provided is inaccurate ? If you or someone on your behalf gives your insurance company false, deceptive, misleading or incomplete information concerning the description and place of garaging of the vehicles to be insured, the names of operators required to be listed and the answers given for all listed operators, your insurance company may refuse to pay your claims under any and all of the Optional Insurance parts of your policy. I just purchased a used car that already has an inspection sticker on the windshield, do I need to get a new one? Yes any new ownership requires a new inspection sticker within 7 day from registration date. The best competitive rates, the best service before, during and after you buy. 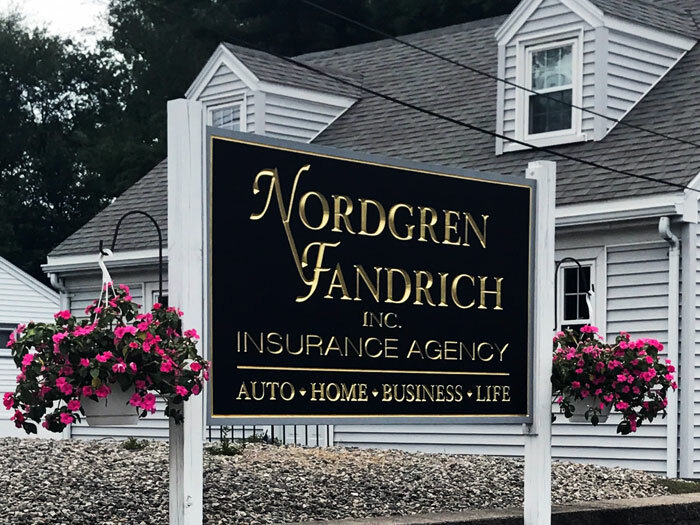 We work for YOU, not the insurance company. 1986 Agency Established by Bob Nordgren and his daughter Pat Fandrich. 1997 Kim Panos, Pats daughter joins the Agency. 2007 Company moves to new larger location. Insurance for what matters most!